After really struggling in my last three outings, I was just hoping to catch a few fish in todays match! 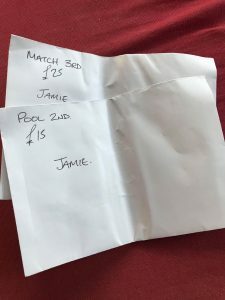 I got to the bowling club nice and early and another excellent breakfast set me up for the day before I paid my pools and waited for the draw. 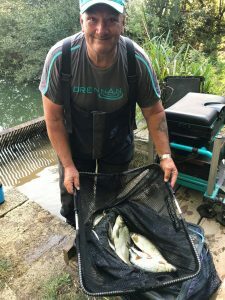 With all the anglers fed and watered, Nick put all the balls in the bucket of fate before inviting us all to delve in and find out where we would be for the rest of the day. By the time I stuck my hand in, there were still a few balls left and I had a good rummage before pulling a ping pong ball out to reveal I was on peg 2 again! Hopefully I’d do a better job than I did last week! We got out the pond and it was nice to see the level was nearly back to normal although it’s still gin clear which probably wouldn’t do us any favours, especially with the roach. 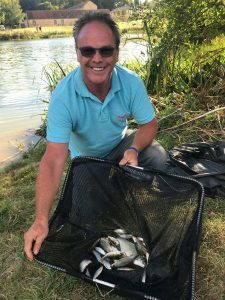 Paul Homewood was on peg 1 and asked if I wanted a pound on it and the only other anglers I could see were Stuart on 16, Nick on 19 and Dave on 20 although they were all in the other section. Jake was down on 14 with a hungover but that never seems to affect his fish catching ability! 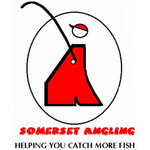 The other anglers in my section were Rob on 5, Big Frank on 6, Terry ‘The Toast’ on 7 and Adie Bishop on 9. I was still going to put some kit in for the skimmers but I was intending to fish for roach and have a look on the big fish lines every hour for ten minutes, or longer if I was catching. I’d mixed up some Pro Natural Dark, Pro Natural Bream and Special G Gold the night before plus I had a pint and a half of casters, half a pint of red maggots, some dead reds, two tins of corn, and a pint of hemp. I was just going to use the photo from last week but I’ve treated you to a different angle instead! I set up two rigs for today, a 4 x 16 Preston Chianti to fish just off the tree to my right at 10 metres and then 11.5 metres straight out, both lines had the same depth and a 0.5 gram Drennan Roach for 10 metres straight out. There was a bit of ripple but the wind was blowing down towards peg 10. 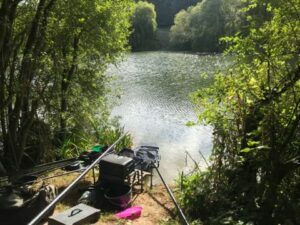 On the whistle I cupped in a single ball of groundbait on the 10 metre line before feeding both the other lines with three balls containing plenty of grub and potting in a full cup of corn, casters and hemp over the top. I started at 10 metres with a single caster on the hook and had a small roach first chuck, I was getting a bite every put in but most were less than an ounce and over the remainder of the first hour, I had 25 fish which included two Dillington barbel (gudgeon) and they were probably the best fish! So with sixty minutes gone and probably only a pound in the net, it was time to try the skimmer lines. I slipped on a grain of corn and went over the 10 metre line first, I was hoping to catch quite quickly but after ten minutes, I’d only had a few knocks and added another section to try the longer line. From what I could see nobody was bagging up, Nick had swung in a couple of small fish as had Dave next door and Paul said he’d only had a few bits. I gave it ten minutes on the longer line but still no proper bites and I decided to have another quick go by the tree before putting some more feed in and fishing for roach for the rest of the second hour. After a few minutes, a really positive bite saw a fair bit of elastic come out on the strike and nearly straight away I could see it was a decent skimmer in the crystal clear water. I shipped back gently and netted a nice fish around the pound and a half mark. Thinking they might have moved in, I gave it another quarter of an hour but no more indications so I cupped in some more feed and went back on the longer line. I was just thinking about fishing for roach for a bit when Nick had two decent skimmers one after another. 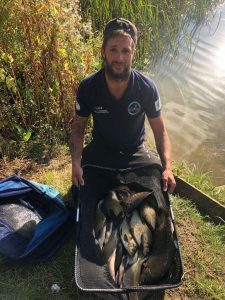 As we passed the two hour mark, Rob turned up and said he was struggling, I asked how the others were doing in our section and he said Adie had caught some skimmers early but had slowed up now, Frank had a bream and a couple of skimmers, Terry was catching odd small fish and he didn’t really know how Jake was doing. Then out of the blue, my float sailed away and I had my second decent skimmer. He left me to it and I gave it another half an hour but no more bites so I cupped in some more feed on both lines before going back on the roach line. Paul had landed a 12oz chub and a similar sized skimmer so there probably wasn’t much between him, Nick and me at this stage. I added another 13 roach over the next half and hour to put me on 40 fish for around 5lb but I still felt I needed bream and skimmers to do well. I went back over the other two lines but it just wasn’t happening and I hadn’t seen Nick have anything else either. A few times, when the ripple had gone, I could see some decent chublets swimming around out past the pole line and I kept thinking I should set up a shallow rig and have a go for them. 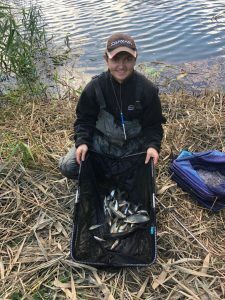 It sounded like most people were struggling apart from Adie and Jake who had caught well on the feeder and Frank was probably third with a bream and two skimmers for around 7lb. I could see Paul was now catching a few small fish so with an hour to go I finally got off my box and set up a shallow rig, a little Preston Chianti. I went out to 11.5 metres feeding casters and hemp and started catching straight away, not chublets but small roach although I did have three around 3-4oz apiece which I netted to be on the safe side. 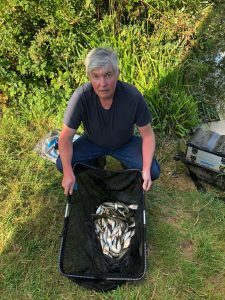 I had 30 fish for around 2lb in 45 minutes, Rob had packed up and came and sat with me, he confirmed that Jake and Adie had bagged up but nobody else had much. 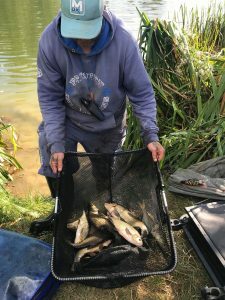 Then with around ten minutes to go, Nick struck into a decent skimmer, I thought I might still be just ahead of him but then he’s shipped out and was into another good fish straight away. I said to Rob I needed another bonus so went back out on my skimmer line with corn on the hook. Nick’s fish was obviously a chub as it was giving him the run around and went into the reeds, I thought it had snagged him solid but fair play to him, he got it out. 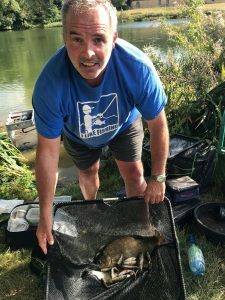 Then my float sailed away and I was into another skimmer, I shipped back carefully and was relieved to slip the net under another pound and a half fish, Rob said I still had time but as soon as I shipped out and lowered the rig in, Nick blew to end the match! I asked Paul what weight he had and he replied 3lb 6oz which was very precise. Rob came and got the scales to start the weigh in and I went with him to get some photos. 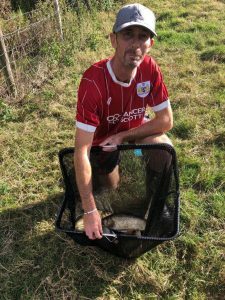 Adie was first and he had a lovely net of skimmers, two proper bream and a couple of little tench for 21lb 15oz but he said Jake, who was in the other section, had more. Terry was next and had 2lb 10oz, Frank had a good bream, two skimmers plus some roach for 8lb 6oz, Rob didn’t weigh and then it was my turn. I honestly thought I’d be just short of Franks weight with around 7-8lb (three skimmers for 4.5lb plus 3lb of roach) but I actually weighed 9lb. Paul was very close to his estimate with 3lb 12oz which meant I’d won the pound and should win the section. So another intriguing match, bream and skimmers continue to dominate the top spots but 9-10lb has been enough to frame the last two weeks. I think I fished a half tidy match today, if I’d stuck it out for big fish all day, would I have had anymore? I’m not sure, I had three for 4.5lb which would have sneaked the section but it was definitely worth fishing for the roach. I think if I’d fished for roach all day 10-12lb was possible but the result would have been the same, so I think fishing for roach and the odd look for a bonus was the way to go today. I’ll make sure I have a shallow rig set up from the start next week though! What’s better than one envelope? Two envelopes of course! 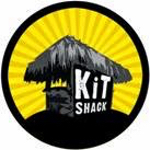 Just a couple more things before I go, I had some great feedback on the blogs Facebook page at the weekend, Steve said ‘To be honest, I have no idea how I stumbled on this page and liked it, but the blogs of matches are one of the things I look forward to reading. Top stuff! !’ It’s always nice to hear that people enjoy what I’m doing, cheers Steve! 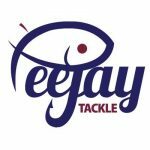 And lastly I know it’s a little way off but we have a match coming up on 7th Oct against Taunton on the Tone and it would be good to get an idea of numbers so could you let me know if you would like to fish that day please? I’ll also put something on the Facebook page.